Dictionary.com is one of the most popular dictionary apps on Android, with the free version racking up between 10 and 50 million downloads on the Play Store. An updated version of the app has just been released which brings a fresh coat of paint and some welcome new features. One of the more useful highlights of version 7.0 is the added support for the floating text selection toolbar introduced in Android Marshmallow. This allows users to quickly search for a definition through the app by highlighting a word and selecting the "Define" option from the popup menu. Other nifty features include the ability to explore locally trending words and a list of your favorite and most recent searches. New, streamlined design makes searching and exploring additional features easier. 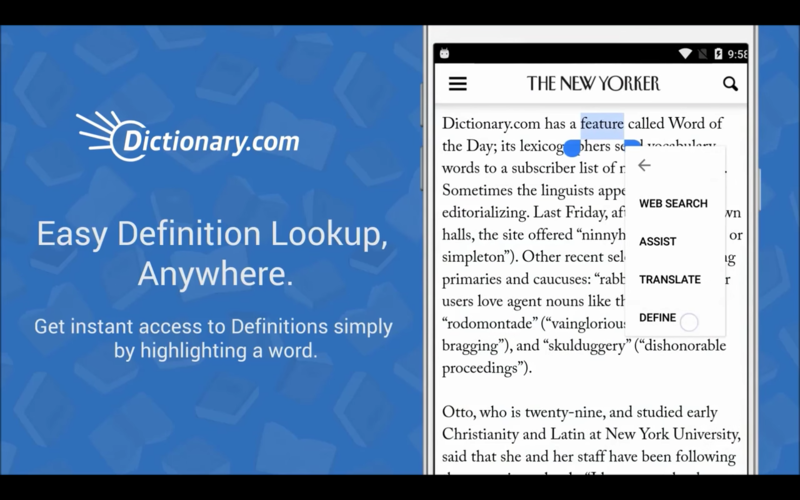 Get Dictionary.com definitions from any app or website: Simply press and hold the word you want to search and select "define" from the menu. Manage your favorite words effortlessly and access your most recently searched terms. You can download version 7.0 of the free or premium app from the widgets below.